Daniel Tieger of Manchester-by-the-Sea commuting to his job in Gloucester— a 20-mile round trip. The shorter days of winter relegate most cyclists to stationary workouts on indoor trainers. Most, but not all. A hardy cadre of local bicycle commuters keeps pedaling right through the dark months, taking on bone-chilling temperatures, elusive sunshine, and roadways that are often slick or littered with potholes. “I like being asked on really lousy days if I rode, and saying yes, nonchalantly,” said Daniel Tieger, 63, a physicist from Manchester-by-the-Sea. “I spent a lot of time in the last 20 years as a bike advocate working to improve infrastructure for cycling, so for me riding to work is also a political statement. Richard Fries, 54, is a Pittsburgh native now living in Lexington. 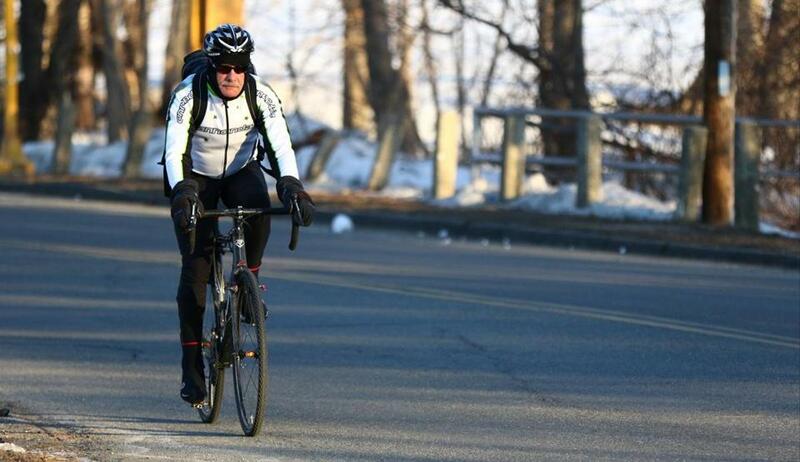 He’s been a cyclist for 35 years, and a bike commuter just as long. Recently appointed executive director of the advocacy group Massachusetts Bicycle Coalition, or MassBike, Fries said pedaling to work is more than just part of the job. Civia Kingfield, Breezer Uptown, and Cannondale Quick Carbon 1 are three of the best options for commuter cyclists. Beverly native Matthew Roy, 42, who lives in Arlington and commutes into Cambridge, agreed that commuting requires a little extra effort. He’ll flex his schedule to avoid rush-hour traffic. “I adapt my commute in many ways based on time of year, time of day, weather, etc.,’” said Roy, a research scientist. “During this never-ending winter I’ve still commuted every day, but I’ve removed roads from the equation almost completely. Tieger installs special studded tires for added grip with snow and ice that can cover pavement. Fries lowers the air pressure in his tires to combat the snow. David Loutzenheiser, 48, a transportation planner for the Metropolitan Area Planning Council, actually keeps several bikes at the ready. However, some of the biggest concerns facing bike commuters are the same year-round, said Fries. In addition to making sure their bikes can handle the uneven road condition, bike commuters also need to make certain they can keep comfortable. The shorter days mean that lights and reflectors are mandatory equipment. The most important thing is to keep pedaling.